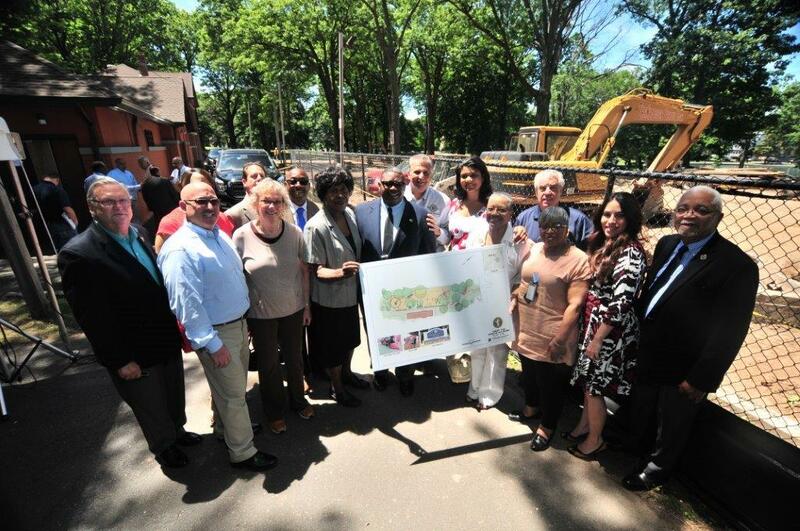 Irvington, NJ – Essex County Executive Joseph N. DiVincenzo, Jr. announced that work to completely renovate and redesign the playground in Essex County Irvington Park was underway on Wednesday, June 15th. The project is part of the County Executive’s ongoing initiative to provide modern and safe recreation facilities throughout the Essex County Parks System. “The playground in Irvington Park is an important feature because it provided children with opportunities for recreation, physical fitness and socialization. This playground was last upgraded in 2003, and replacing it with new equipment and safety surface ensures the park will continue to meet the needs of the community and our children will have a first-class facility on which to play and climb,” DiVincenzo said. “We’ve seen more progress with County Executive DiVincenzo than during any other time period,” Irvington Mayor Tony Vauss said. “The improvements being made to this playground is an example of everyone working together to build a strong community and create great memories for our young people. Our children will know that people cared enough about them to give them an appropriate place to play,” he noted. The Irvington Park Playground is receiving a complete makeover. The main climbing apparatus will have a train theme. In addition, there will be swings, a hollow log for children to climb on and crawl through, a rock climbing feature, cargo net climber, a spinning feature and a mister for water play. Apparatus will be arranged in sections that are age-appropriate for children ages 2 to 5 years and 6 to 12 years. In front of the D. Bilal Beasley Community Center will be a picnic area and stroller parking area. Whereas the old playground had open areas of natural grass, the surface of the new playground will be completely comprised of a rubberized safety surface. The old playground equipment and rubberized safety surface was installed 13 years ago and needed to be replaced because of regular wear and tear. About 200 trees and bushes will be planted around the playground area and the wrought iron fence along May Street will be repaired. Local elected officials share their support of the project. “I used to talk with my father about nurturing and comforting. The new playground will nurture children and the community center that was recently renovated and named after my father will comfort our seniors. A lot of friendships and positive changes are being made here because of the improvements that are being done,” Omar Beasley, son of the late Freeholder and Councilman D. Bilal Beasley said. “As a State Representative, it’s great when we vote on Green Acres bills and come here and see tangible construction and how the money is being used. We recognize how critically important a park is for the community, how it is a valuable asset for recreation, respite and education. And we recognize the history of these places while making sure the open spaces meet current needs,” NJ State Senator and Deputy Chief of Staff Teresa Ruiz said. “With Olympic Park as part of its history, Irvington was always known as the center of recreation. So it only makes sense that Irvington Park is revitalized so it becomes the center of recreation for the Township,” Assembly Speaker Emeritus Sheila Oliver said. “Joe has a track record of getting the resources to get things done and improve the public’s quality of life. Today’s playground groundbreaking is an example of that,” Assemblyman Ralph Caputo said. “It’s always a pleasure to come to one of our county parks, and with the work of our County Executive it seems like we visit at least once a week,” Sheriff Armando Fontoura said. “Joe makes sure that every park gets what it needs so children, seniors and the public can come and enjoy the open space,” he pointed out. “This playground and park are an oasis. The County Executive is making sure people have a place to find fresh air and safe place for recreation,” Essex County Deputy Chief of Staff William Payne said. “It’s a privilege to join with my fellow Freeholders and unanimously pass contracts for these playground improvement projects. It’s great to see these projects moving forward so quickly,” Freeholder President Britnee Timberlake said. “This is a great day for Irvington. I am proud to participate in programs that are making our Township a great place to live,” Freeholder Lebby Jones said. Freeholder Patricia Sebold reminisced that she used to go ice skating in Irvington Park. “These types of projects are making Essex County and Irvington a desirable place to go,” she pointed out. “The late D. Bilal Beasley, our councilman and freeholder, would be proud of his friendship with Joe DiVincenzo, Tony Vauss and other leaders because of the commitment being made here to make this park and the township great,” Freeholder Wayne Richardson said. “Today is a great day because the playground is being revitalized so our children have safe and happy places to play,” Irvington Councilwoman and Irvington Park Conservancy President Sandra Jones said. “I thank Joe DiVincenzo – he’s the gift that keeps giving,” she said. Remington & Vernick from Secaucus received a $51,000 contract to design the playground. Shauger Property Services from East Orange was awarded a publicly bid contract for $988,553 to perform the construction work. The Essex County Department of Public Works is monitoring the project and answering questions to ensure delays are avoided. The playground upgrade is being funded with grants from the NJ Green Acres program and the Essex County Recreation and Open Space Trust Fund and through the Essex County Capital Improvement Budget. Work started in May and is scheduled to be completed by September 2016. In 2016, the parks building was completely renovated and renamed as the “Essex County D. Bilal Beasley Community Center” in honor of the late Irvington Councilman and Essex County Freeholder D. Bilal Beasley. In 2011, a synthetic grass surface soccer field was installed and three entrances to the park were upgraded as part of a $1.2 million modernization project. In 2006, a two-story, 2,100-square-foot addition was constructed onto the community center to create more space for the public to meet, storage space and public restrooms. The project cost $897,000. In 2004, the tennis courts, walking track, basketball courts, tennis courts, softball fields and three park entrances were upgraded as part of a $1 million facelift. In 2003, Essex County spent $103,000 to install a rubberized safety surface in the Irvington Park playground and $38,000 to improve the lighting in Irvington Park and Branch Brook Park in Newark. Essex County has partnered with the Irvington Amateur Radio Team (I-ART) to obtain funding from the New Jersey Green Acres program and the Essex County Recreation and Open Space Trust Fund. The Essex County Park System was created in 1895 and is the first county park system established in the United States. The Park System consists of more than 6,000 acres and has 22 parks, five reservations, an environmental center, a zoo, Treetop Adventure Course, ice skating rink, roller skating rink, three public golf courses, golf driving range, two miniature golf courses, three off-leash dog facilities, a castle and the Presby Memorial Iris Gardens. Irvington Park is 24.38 acres and is the 12th largest park in the Essex County system. Land for the park was purchased in 1906 and improvements to the site were completed in 1913.